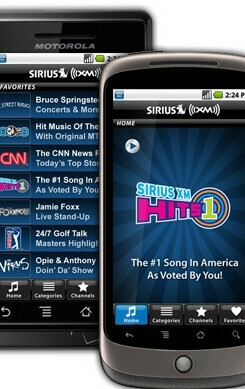 Android users have waited long enough, but it appears that starting in May owners of the Motorola DROID and Google Nexus One will be able to download the free Sirius XM Radio app, which has already been avaliable to iPhone users for a year and BlackBerry users since February. Even though the app will be free to download, you will be required to have a Sirius XM Premium Online subscription to be able to stream stations over 3G and Wi-Fi networks, but there will be a free 7-day trial. What we find interesting is that there is no reason given as to why the app will only be avaliable for the Motorola DROID and Google Nexus One at launch, but we can hope that more Android 2.1 devices (such as the HTC Droid Incredible) will be granted use of the app in the near future. You can click here to sign-up for a notification as to when the app is avaliable. Nice job picking this story up 2 days after it was on every other site. Are you guys this slow on all news, or just non att/apple? They are only mentioning currently released 2.1 Handsets is all. The Incredible has not been released thus why they didn't mention it. It's an Android 2.1 App. So if you have 2.1+ you may use and download it. thats about what i got out of it. should they name every phone to get 2.1 too.. or just the ones that currently have it..LOL. basically, if its got 2.1, it should work.